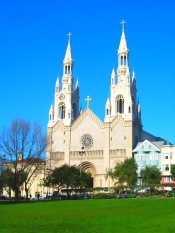 North Beach....an Italian Neighborhood with a "funky feel". Discover the many interesting cafes, restaurants and coffee houses in in this fascinating neighborhood. 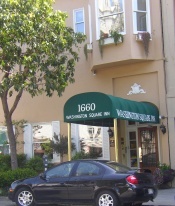 This charming area is located between Chinatown and Fisherman's Wharf. There actually was a beach (on Columbus toward the Transamerica Building) until the 1860s when landfill changed things. Many fishing immigrants from Italy (especially Genoa and Sicily) came in large numbers 1870 and later. By the 1930s there were about 60,000 Italian Americans living here. Their numbers dwindled until the 1950s when it became a haven for writers and artists during the "beat" era. There are still many Italian businesses in this area. Nearby Telegraph Hill (around 1850) alerted residents of ships. 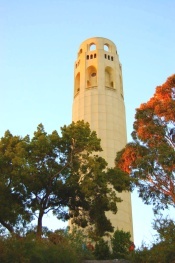 "Coit Tower", on the top of the hill, was erected in 1933. There are murals in the tower to check out and a fee to climb the tower. The 360 degree view of the city is breathtaking. Sts. Peter and Paul Church is called the "Church of the fisherman" (still has a yearly "blessing of the fishing fleet". Italian craftsman carved the beautiful altar and ornate columns and made the stained glass windows. Washington Square - adjacent to church, large grassy area where Tai chi is practiced in the mornings and artists sell their creations on the weekends. Bronze Firemen Statue - Made in honor of firemen who in 1933 saved a young girl from a tragic fire. Museum - 1435 Stockton, contains many old photos of the area. Bill Weber mural - Broadway & Columbus, tells the history of the area. Church of St. Francis of Assisi - 610 Vallejo St., original church built in 1856, first California church founded since the time of the Spanish Missions. City Lights Bookstore - 261 Columbus, first paperback bookstore opened in 1953 and popular during "beat" era. 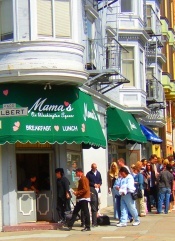 Mama's is famous for it's great breakfast. North Beach Pizza 1499 Grant - known for it's great pizza. Caffe Sport 574 Green - Sicilian cuisine in "old world" setting. Trattoria Contadina - great authentic Italian food. San Remo Hotel - 2237 Mason St. Family-owned small 62 room Victorian style hotel. Simple, inexpensive rooms with shared bathrooms. Washington Square Inn Bed and Breakfast - 1660 Stockton Street Fifteen room European-style Inn, serves wine and cheese snack in the late afternoon, simple Breakfast, smaller rooms are less expensive. Two other interesting San Francisco Neighborhoods to check out are Chinatown and Marina. Enjoy your visits to these charming neighborhoods....a great choice for California vacations.